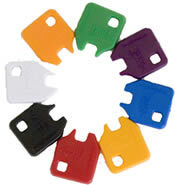 Cobra Tubular Key Covers are available in a large range and variety of colors. These covers are made of a strong durable plastic and press fit onto our tubular keys. The colors available are: red, yellow, orange, black, blue, green, white, navy blue and purple. Please specify your desired color when ordering.